Cambridgeshire County Council has announced plans to impose a £1 a day parking fee on people who use the area’s bus park and ride network. Stagecoach has warned this will penalise greener travel, and tax on bus passengers who make 3.65 million trips a year through park and ride sites. Council officers admitted that the plan is likely to lead to a 5% drop in use of the park and sites, an annual loss of more than 180,000 trips by bus and a switch to car journeys into the congested city centre. Stagecoach said council suggestions the lost bus journeys would recover quickly was ‘complacent’. It said the council’s charging plan risked many people switching back to car travel permanently. The huge rise in car journeys would also increase road maintenance costs and result in higher traffic pollution. Andy Campbell, Managing Director of Stagecoach East, said: “The council has for years been one of the most pro-bus authorities in the country. This approach has helped build one of the best bus networks in the country and benefit the environment. We also appreciate these are tough times for councils hit by lower central government funding. “But the decision to impose parking charges on park and ride users is nothing short of a stealth tax and will push up the overall cost of getting to work by around £200 a year for daily commuters. “It will hit health service workers, people who work in higher education and those with training places. People on lower incomes who use the park and ride sites will be disproportionately hit. “The council’s plans are extremely short-sighted. While the park and ride sites cost around £1m per year to operate, the success of these facilities saves money which would otherwise have to be spent on more roads maintenance and the health impact of higher pollution. Stagecoach said it had put forward an alternative solution which would have allowed passengers to continue to use park and ride without a parking charge. 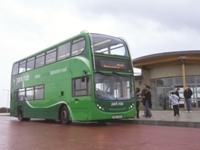 The proposal involved Stagecoach staffing the park and ride sites more cost-effectively and reducing the cost to the County Council to zero over a three-year period. Stagecoach Cumbria and North Lancashire has launched a new shuttle service to improve connections between Grasmere and Keswick, which were impacted by a road collapse on the A591 following Storm Desmond.